Relatively small in stature, the Boost delivers the low-end better than many larger units can't muster. We get lots of pitches from Bluetooth speaker manufacturers, and not all of the products that come through the door turn out to be shining beacons of audio fidelity. 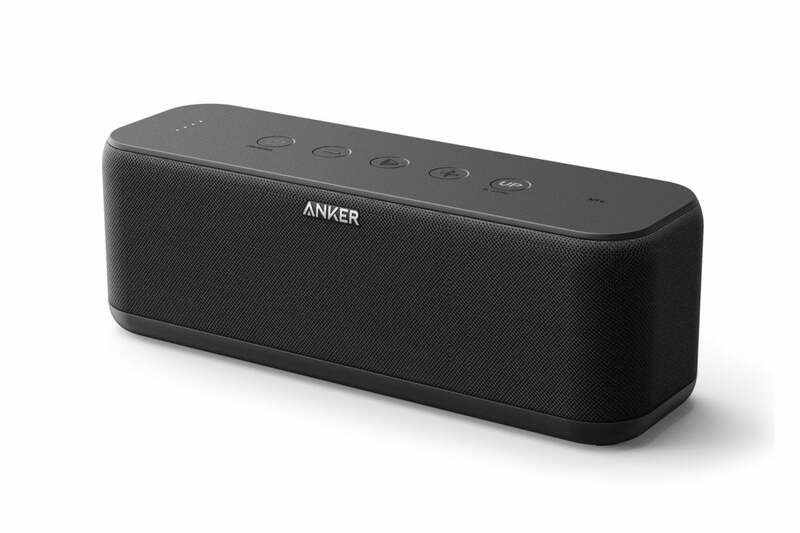 Anker’s SoundCore Boost proved a pleasant surprise, especially in terms of the low-end frequency response it delivers for its modest price tag. The SoundCore Boost is a black rectangular box with rounded (in the vertical) corners that measures approximately 8- by 2.8- by 2.7 inches and weighs a hair over 20 ounces. A firmly attached captive rubber plug hides a full-size USB port for charging other devices, a micro-USB port for charging the speaker, and a stereo 3.5mm auxiliary input. It feels very solid, though some of that no doubt comes courtesy of the hefty 5,200mAh battery. Five buttons on top control the speaker: Power/Bluetooth pairing, volume down, play/pause, volume up, and a bass-boost button labeled simply UP. The controls pull double-duty during phone calls for answering, rejecting, switching, and ending calls on a paired smartphone. The overall sound of the Soundcore Boost is very good for its class, but hardly sonic perfection. The upper mids are a bit stunted and muddled at higher volumes; but that’s par for water-resistant (IPX5) stereo speakers, and the Boost actually suffers less from the weather-proofing than many a speaker with the same design criteria. The SoundCore Boost’s controls are simple, easy to understand, and control your phone calls as well. The Boost is rather directional, so placement and angle are important if you want the best results. And being front- and rear-firing it’s also highly dependent upon its surroundings. The sound from the back is more muffled than that from the front, so I’m guessing it’s passively radiated or ported. The upshot was that I preferred the speaker set well away from a reflecting surface to minimize the effect. Okay, this may seem odd, but the Anker (and many other speakers of similar design) sounds best when held to the back of your neck, firing past your ears. Why would you do such a thing? I do it to see if the speaker is stereo (the Boost is) or mono and also to eliminate the effect of the environment so I can more accurately gauge the overall frequency reproduction. You might do it to listen to music on your phone through better speakers when you’re lying on the grass with the SoundCore Boost as your “pillow”. Like peanut butter and bologna, it’s one of those unlikely things that just works. Frequency-wise, there’s plenty of thump when you press the UP bass-boost button. It might not make it for dance parties, but I found the best balance quite to my liking. The top-end is much better accounted for than the usual water-resistant speaker. Note that the volume dropped quite a bit for phone calls. This is good thing if you’re playing it loud, not so much if you’re playing the speaker quietly. I saw about 11 hours of run time out of the SoundCore Boost playing quietly with the bass boost on. Your mileage will vary. The Boost also appeared in the Bluetooth device list immediately, and paired quickly with all my devices, including my older Windows phone. This is not always the case.If your phone supports NFC (near-field communication), you can pair it even more quickly. The affordable Anker SoundCore Boost's stereo sound compares favorably with the big names, and it's IPX5 water resistant to boot.